Well I spent the past few days working on some recipes to turn into recipe cards for farm mkt sales. I am pretty pleased with the results and the online printing firm is exactly what I need for my small scale work. I use "Overnight Prints". What I like about them is I can create small batches of print items and upload my artwork modified just as I need. For instance I wanted a small tag for our bundled lavender. So I sent in an artwork design that uses the business card size as a template when they arrive I cut the cards in half 2 cards for the price of a business card. They are on nice card stock with a waterproof ink. Most printing firms print the business cards for a song so it is an inexpensive way for me to print till I get up my production to a size where I can afford to print. My recipe cards are beautiful with rounded edges and a picture of the item on one side and the recipe on the other. It really takes my creative bent to the extreme. I take my own picts and develop the recipes. 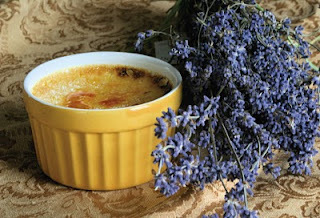 Attached is a pict of the creme brulee.